Oh oh oh the early spring-summer is in town! So get up and enjoy the secret little green spots in Antwerp! 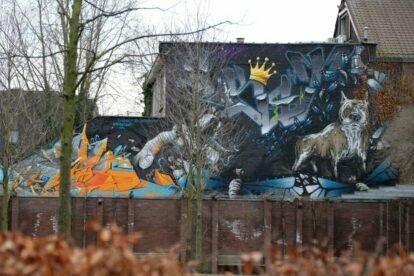 If you look around corners, into parks, on walls along the big streets in Antwerp, you will discover urban graffiti spots. Munthof is a park, surrounded by walls where graffiti artists paint their identity. Go for a picnic or lie in the grass. Discover our urban art! There is often new work to see, and if you are lucky you can see an artist ‘at work’. You can come here during the day and during the night, it is a safe place. Munthof is located in the ‘Sint-Andries’-area. Notice the little eco-gardens, those belong to the neighbours of the Sint-Andries area. The cosy city-garden is 90m2 and the first seed was planted in 2014. It is a neighbour-initiative. Thirsty? Go check out the organic juices in the ‘Ecohouse’. Personal lunch tip: for lunch go to Native Bio Bistro (organic, veggie, vegan). Other graffiti spots: Park Spoor Noord, Train station Berchem, Binnensingel (close to Pretoriastreet).